It’s funny how sometimes both of my baking groups (Heavenly Cake Bakers and Tuesday with Dorie) are in synch and totally random pick a recipe that shares a common ingredient. Sometimes the recipes are so close that I have to make an executive decision and choose which one I want to bake more. No sense in having 2 cakes in the house, especially when I try to get rid of it as fast as I can in the first place – no temptation in sight! This past weekend Tuesday with Dorie choice won. Thank you to Kimberly from Only Creative Opportunities who made the choice. No trip to the supermarket to find an ingredient that I ran out and forgot to put on my shopping list. Have I mentioned how I hate to go to the supermarket? No? Well now you know – your welcome. Anyways, I did have most of the ingredients at hand - even the bananas. The only thing I added to the regular recipe was lots of walnuts to it and I did sort of double on the coconut, because I mean we cannot NOT have TOO much of a good thing in cake. I did not bake it in 2 pans, but used my 9x3-inch pan, and the left over batter went into a small loaf pan left over from my HCB Mini Vanilla Pound Cake. (I know, I know, Rose’s is rubbing off me on the use of the extra batter by baking 2 of something). But, this time it worked and the reason it did was because I baked this caked on Sunday and left a huge “DO NOT TOUCH IT” note on top of it. I still needed to be frosted and I was not going to get to until Monday night. So that extra cake I baked was perfect to get a tasting before hand. Oh boy! Was it good. Lots of Banana flavor, with a hint of the crunchy coconut and rum taste. 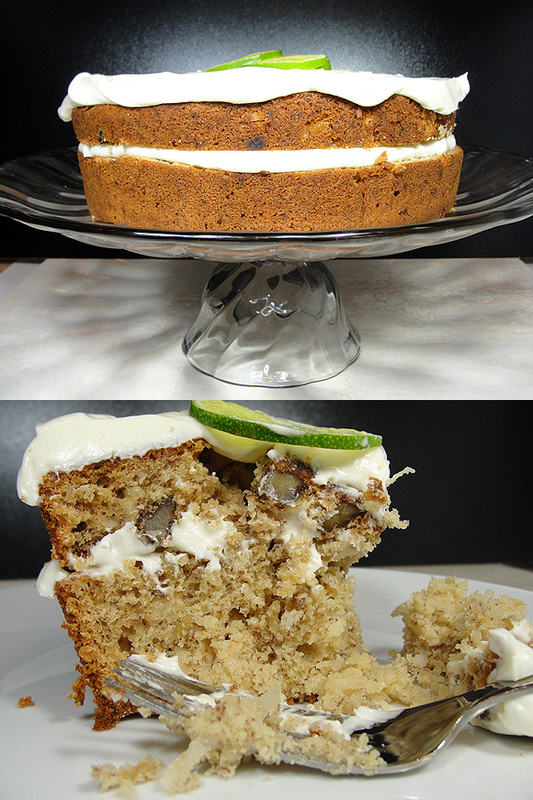 I choose to frost it by making a Coconut-Rum Cream Cheese frosting and the tang of the frosting was perfect for this moist, crumbly cake. So far the reviews have been great. Tom loves anything with banana in it, so he was won over the second I put the “tasting piece” in front of him and totally won him over when he tasted the final frosted version to quote him "I did not think it could be better, but I was wrong - the frosting takes it to another dimension". Most of my co-workers raved about it and told me they were coming here to get the recipe (Hi gang!). As for me, this one goes on the “repeat” list. Have I convice you yet? Then head over to Kimberly’s blog for the recipe and if you want to see the other creative variations you can click over to the TWD group. Or buy the book! And if you are curious on the “other” choice you can head over to my HBC group to see their creative variations. In a medium bowl, with your mixer on medium high beat the cream cheese and butter until incorporate and fluffy. Add the lime juice, rum and coconut cream and beat some more. Lower your mixer speed to low and ¼ cup at a time start adding the powder sugar, beating after each addition until you are satisfied with the flavor - I don’t like my frosting overly sweet, so I ended up using about 1 ½ cup of sugar – but you can add more, up to you.